There are so many types of butterflies that it takes a book to list them all. 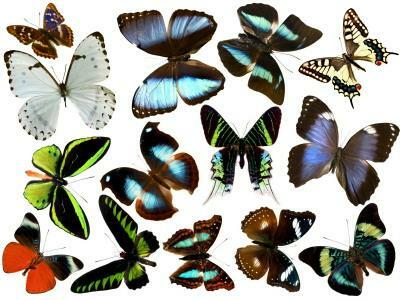 Butterflies and moths together make up an order of insects called Lepidoptera. This group contains over 180,000 known species! Danaidae (Danaus plexipus): Milkweed butterflies are the most common of this type of butterfly and is found in what's termed the Old and New World tropics. 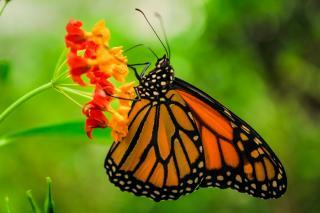 Two exceptions are the monarch butterfly (q.v.) and the queen butterfly. Both live in temperate regions. Heliconiinae (Heliconians or longwings): This is mainly a tropical butterfly family and can be found in Old World and New World tropic regions. Hesperiidae (Common skippers): These small to medium butterflies are part of the Superfamily Hesperioidea and populate the world. However, they mostly congregate in the tropics. Out of 3,500 species, there are 275 in North America. Many of these are concentrated in Texas and Arizona. Libytheidae (Snout butterflies): These butterflies are found all over the world, but there aren't many species within this family. Lycaenidae (Gossamer-winged butterflies): There are over 5,000 species of this small to medium sizes butterflies. 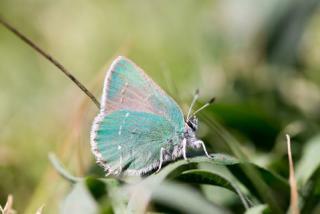 They have several names such as hairstreaks, coppers, harvesters, blues, and metal marks. Most prefer tropical habitats; however, 145 species can be found in the United States. Megathymidae (Giant skippers): This North American family of skipper butterflies is known for being strong-flying. 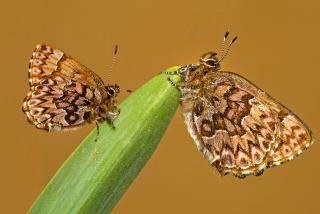 They are typically considered a subfamily of Hesperiidae. Nymphalidae (Brush-footed butterflies): This butterfly family has around 6,000 species divided into 12 subfamilies and 40 tribes and found throughout the world in most habitats. 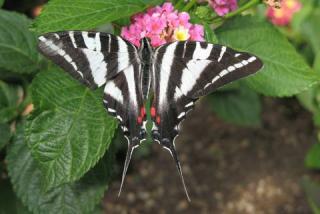 Papilionidae (Swallowtails): There are around 550 species with the majority being swallowtail. Most of these are found in tropical regions as well as other regionals around the world except Antarctica. Parnassiidae (plural Parnassians): Are alpine or arctic group and found in America's Rocky Mountains and Alaska. Pieridae (Whites, sulfurs and orange-tips): More than 1,100 species, these butterflies are medium-sized prefer tropical habitats, but are found around the world. Satyridae (Nmphs, satyrs and arctics): There are 50 species in this family and are found in North America preferring meadows, open forests and grassy fields. 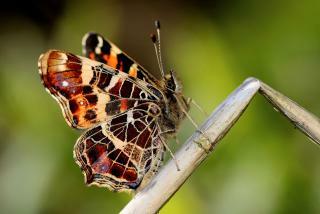 While, scientifically, butterflies are categorized into species and families, they can also be separated into habitats. Each habitat offers unique sources of camouflage and nutrition to the butterfly. Each type of eco-system has different butterflies that thrive there. 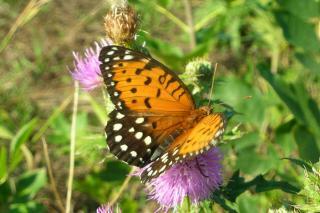 Regal Fritillary: Once prolific in the US, this species is considered secure (no threats) only in Kansas, although it can be found in other states. Monarchs: This reddish-orange butterfly has black vein-like patterns that resemble stained glass. Its wings feature black borders with white spots. 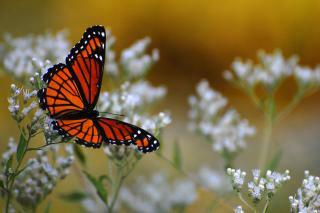 Viceroy: The viceroy is said to mimic the monarch butterfly's pattern with its dark orange coloring and black veins. It even has a row of white spots along the wing edges. 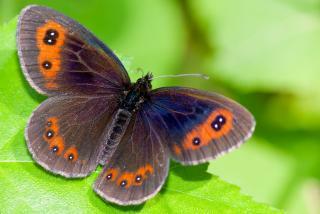 Woodland butterflies are often less colorful than the butterflies of the grasslands. Because of the large variety of food sources, there are more types of butterflies found in this habitat than in any other. 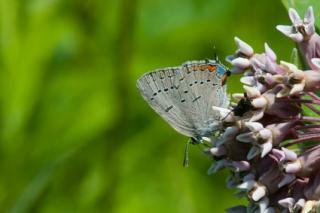 Acadian Hairstreak: The underside is gray and the upper side is brown gray. Each hindwing has a tail. 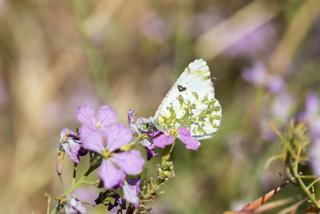 Pine Butterfly: Overall this butterfly is white featuring black veins and wing bars. 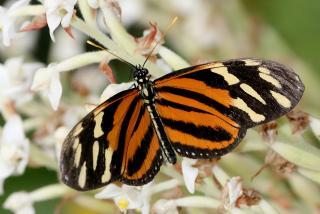 Map Butterfly: In the spring, the butterfly has orange upperwings, while in the summer, the upperwings are black. Piedmont Ringlet: The colors of this butterfly range from dark brown to black on the upperwings with red post-discal bands. 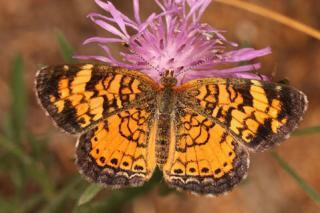 Arctic Fritillary: The color of this butterfly is typically a dark orange with black spots, chevron markings and bars. 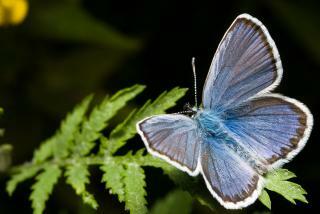 Northern Blue: The male upperside is an iridescent blue while the female upperside is brown featuring orange spots. 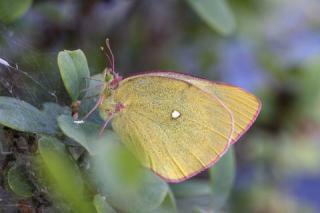 The hindwing has small black dot that marks the outer edges. 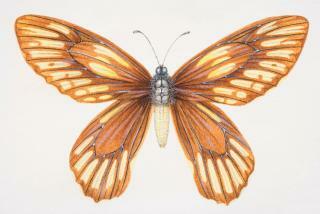 Creamy Marblewing: This butterfly has around a one-inch wingspan with an underside in a marbled cream and green. 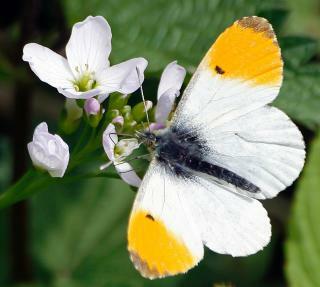 Falcate Orangetip: The tip of the wing is hooked on the tiny butterfly (1.5" to 1.75"). The male has orange coloring, but the female is white with one black spot on the wings. 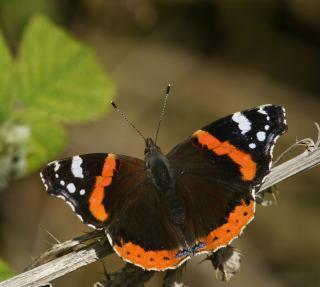 Red Admiral: This butterfly is distinguishable from its black forewings marked with red bars and white spots. The underside of the hindwings features brown and black patterns. Sleepy Orange butterfly: The upper wings are bright orange and have black borders. The hindwings on the summer-form butterflies are a deep butter color, but colder month-form butterflies can range from tan to brick red. Of course the most marvelously patterned butterflies are from the tropics. These brightly colored butterflies live in the tropical areas of the world near the equator. They are extravagantly decorated with colors like pink, bright green, and purple. Because of the favorable living conditions, the tropical butterflies tend to be larger than other types. Isabella: The upper half of the elongated forewings is black with yellow areas, while the lower half is orange and black stripes.Of course the most marvelously patterned butterflies are from the tropics. These brightly colored butterflies live in the tropical areas of the world near the equator. They are extravagantly decorated with colors like pink, bright green, and purple. Because of the favorable living conditions, the tropical butterflies tend to be larger than other types. Blue Morpho: This butterfly upperwings are a brilliant iridescent blue and underwings have several eyespots within the dull brown coloring. When its wings flutter, the blue and brown colors flash, creating a morphing effect. Southern Dogface: Distinctly pointed forewing in addition to the "dog's face" on the forewing top side, which is sometimes visible through closed wings. Prominent in Alabama. 88 Butterfly: The upperwing is black and has blue bands along the edges. The underneath the forewing is red. 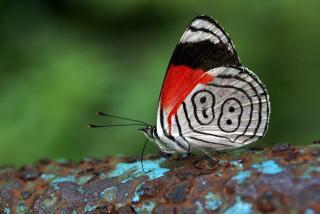 The most distinguishing feature is the underwing that is white and black with the number 88 outlined in black. This beautiful exotic butterfly is found the Florida Keys and is believed to be an accidentally import via a South American plane. 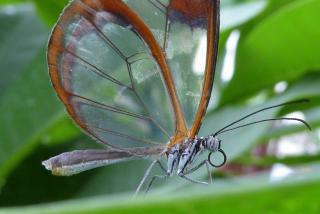 Glasswing Butterfly: This stunning looking butterfly has glasslike wing with black veins and black, red or orange edging. Although a South America and Central America native, a few been sighted in Texas. 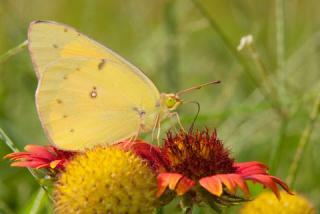 Butterflies are dependent on plants and habitat for survival. In recent times, some of the changes that man has made to his environment have put some of these beautiful creatures at risk. For example, a Californian Xerces Blue was last seen near San Francisco in 1941 and is presumed extinct. 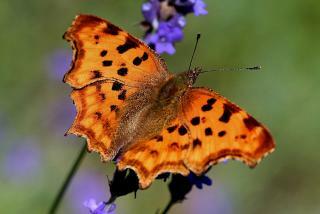 As long ago is the 1800's, the Large Copper butterfly became extinct in Britain. Once a butterfly is extinct, there is no way to get it back. Its beauty and place in the environment is lost forever. Queen Alexandra's Birdwing: This butterfly has an astounding one-foot wingspan and is the world's largest living butterfly and is found in just one place in the world - New Guinea rainforests. 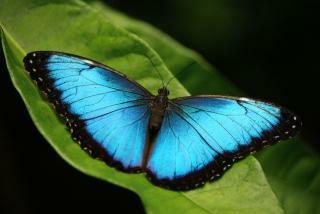 Its stunning colors include aquamarine, neon-colored green, and brown wings with yellow spots. Zebra Swallowtail: A fairly large butterfly (2.5" to 4" wingspread) with green wings featuring blue, yellow and black bands, the Zebra Swallowtail can be observed in Texas and Florida. 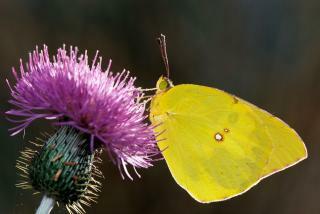 There are several interesting sites about butterflies that can help you learn about butterflies. Butterfly information, clubs, cams, and pictures abound on the internet. If you are a teacher, there are many sites with printables and teacher's helps as well. Smithsonian National Museum of National History offers a wealth of information, exhibition guides and a photo gallery of butterflies. Thematic Butterfly unit for preschool and kindergarten and can be used by teachers and homeschoolers. Preschool printables can be a fun way to get children interested in butterflies. Butterfly coloring pages from Coloring Castle are free that you can use to create a butterfly coloring book. To encourage butterflies to your garden, you can plan a butterfly garden, provide the things that they like to eat, grow a butterfly garden, and install a butterfly house or two. These things will allow you the enjoyment of observing butterflies while helping them to survive and thrive.